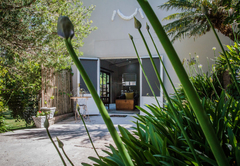 Aan De Oever Guesthouse is a 4 star graded B&B offering Swellendam accommodation in 12 guest rooms. 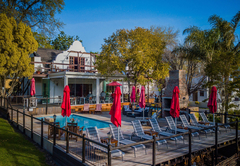 Aan de Oever Guest House is situated on the banks of a small river, in an area known for growing fruit and vegetables for the earlier travellers, hence the name - Koornlands River. 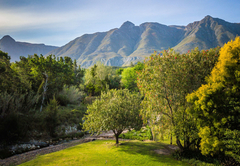 Aan de Oever offers a selection of well-appointed and elegant rooms with majestic views over the Langeberg mountains. Aan de Oever offers a selection of well appointed, charming and elegant rooms, each with private entrance, best quality pure cotton linen, full en-suite bathrooms, modern air-conditioning, wireless internet access in the main house, TV with selected channels, DVD player, honesty bar, coffee / tea making facilities, private patio / balcony and most modern comforts. 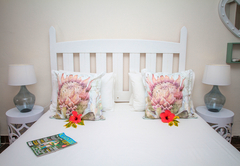 All King-size beds can be converted to a single beds on request. Children are welcome and provision is made for in certain rooms. Double bed, bathroom with a separate bath and shower. The room faces a quiet street and is equipped with most modern comforts including air-conditioning TV, DVD player, honesty bar and coffee / tea making facilities. Queen bed, bathroom with a separate bath and shower. The room faces a quiet street and is equipped with most modern comforts including air-conditioning, Wi-Fi, TV, honesty bar and coffee / tea making facilities. King-size bed, bathroom with a separate bath and shower and a private patio. 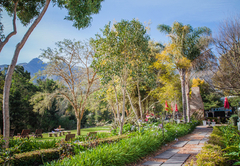 It has a lovely view over the Khoi pond and the Langeberg Mountains as well as the beautiful garden. The room is equipped with most modern comforts including air-conditioning TV, DVD player, honesty bar and coffee / tea making facilities. This room is equipped for four guests. King-size bed and two single beds, bathroom with a corner bath and twin shower, sitting area, very private patio. 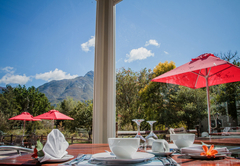 Lovely view over the Langeberg Mountains and the beautiful garden. This spacious family room is equipped with most modern comforts including air-conditioning TV, DVD player, honesty bar and coffee / tea making facilities. On the upper level of the Cape Dutch style house with private stair access. King-size bed, bathroom with a separate bath and shower. The room is equipped with most modern comforts including air-conditioning TV, DVD player, honesty bar and coffee / tea making facilities. 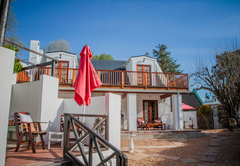 From the large private balcony it overlooks the beautiful garden as well as the Langeberg Mountains. 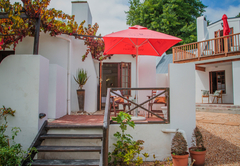 On the upper level of the Cape Dutch style house with private stair access, King-size bed, bathroom with a separate bath and shower. The room is equipped with most modern comforts including air-conditioning TV, DVD player, honesty bar and coffee / tea making facilities. 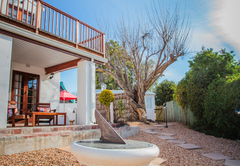 From the large private balcony it overlooks the beautiful garden as well as the Langeberg Mountains. 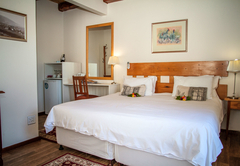 Our smallest room with Queen size bed, en-suite bathroom with shower, private patio with lovely views of our garden and the mountains. 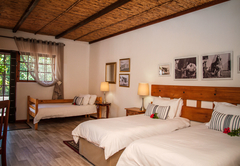 Very spacious room with King-size bed which is both mountain and garden facing The room has an en-suite bathroom with shower and separate toilet. 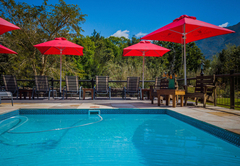 There is also a TV, DSTV, mini bar, air conditioning and all modern amenities including Wi-Fi. This family unit is situation on the ground and upper level of the house with two King-size beds upstairs, two bathrooms with toilet and shower each and a sleeper couch on the ground floor. 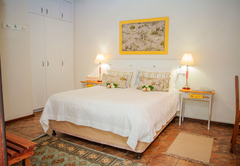 The room is equipped with most modern comforts including air-conditioning TV, DSTV, Wi-Fi. 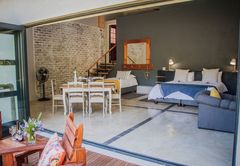 This rooms has a King-size bed and an en-suite bathroom with shower (no bath), and a private patio. 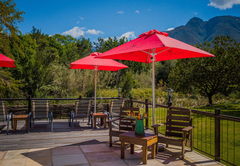 It has a lovely view over the Langeberg Mountains as well as the beautiful garden. 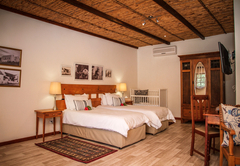 The room is equipped with most modern comforts including air-conditioning TV, DSTV, Wi-Fi. 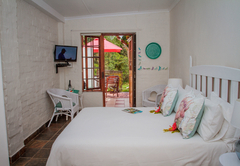 This room has a Queen-size bed, en-suite bathroom with shower (no bath), private patio with lovely views of our garden and the Langeberg Mountains. The room is equipped with most modern comforts including air-conditioning TV, DSTV, Wi-Fi and honesty bar and coffee / tea making facilities. Very spacious room with King-size bed. This room is both mountain and garden facing with an en-suite bathroom with shower and separate toilet. TV, DSTV, Wi-Fi mini bar, air conditioning and all modern amenities. 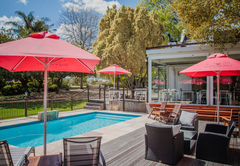 Enjoy our generous breakfasts on a patio overlooking our gardens and the mountains in summer or inside at a log fire in winter. 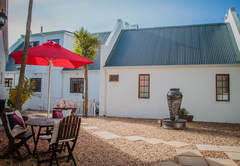 Aan de Oever Guest House is situated in a very quiet street, and in the older part of Swellendam, within walking distance to Drostdy Museum, restaurant and the shops. Upstairs with easy walking stair case. Very spacious room with king bed. Sitting area. Modern open plan bathroom with separate toilet. 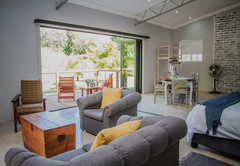 Private balcony with a view over the Langeberg Mountains. 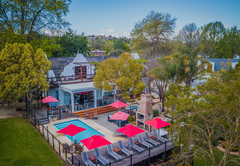 Air conditioning and all modern amenities including Wi-Fi. King size bed or can be converted TWIN beds if pre-arranged. Bathroom with a separate bath and shower. The room faces a quiet street. All modern amenities including Wi-Fi. King Bed with the option of twin bed conversion ( please specify) Bathroom with a separate bath and shower. Private wooden deck and lovely view over gardens and mountains. All modern amenities including Wi-Fi. Family room with king bed and one or two single beds. Bathroom with a corner bath and twin shower, sitting area, private patio. Lovely view over the Langeberg Mountains and the beautiful garden. This spacious room is equipped with most modern comforts. 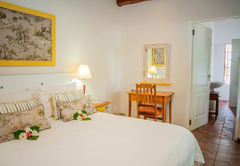 Queen bed only, en-suite bathroom with shower (no bath), private patio with lovely views of our garden and the mountains. Fitted with modern amenities including Wi-Fi . Very spacious room with king bed. Private entrance & courtyard view. En-suite bathroom with shower & separate toilet. 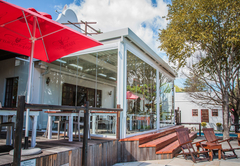 TV, DSTV, Mini Bar, Air conditioning and all modern amenities including Wi-Fi. Very spacious room with king bed. Extra sofa - bed for young adult or child. Private entrance & courtyard view. En-suite bathroom with shower & separate toilet. TV, DSTV, Wi-Fi Mini Bar, Air conditioning and all modern amenities. Excellent stay with a charming host in a lovely building. 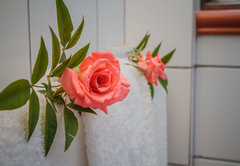 Lots of love & and care has gone into every aspect of the guest house. We will be back next year. A truly wonderful short stay. How I wish we had booked longer. This guesthouse is delightful and very well appointed. Sadly we had only booked for one night but we enjoyed a wonderful breakfast in the lovely garden before we left. We were made to feel very welcome and even received a little 'goody bag' on our departure containing little nibbles to enjoy on our journey - remarkable. Thank you. Response timeAan De Oever Guesthouse typically responds to requests in 5-10 minutes.